Sandra Murchison is the Director of the School of Art and Design at Eastern Michigan University. Prior to EMU Sandra was a Professor of Studio Art at Millsaps College, where she taught printmaking, painting, drawing and book arts. She was the recipient of the following professional awards: the 2014 HEADWAE Faculty Award for Millsaps College, the 2013 Millsaps College Distinguished Professor Award, the 2011 Mississippi Humanities Council Humanities Teacher Award for Millsaps College and the 2011 Richard A. Smith Award for Excellence in Scholarship or Creative Work at Millsaps College. Sandra was also the Founder and Director of a non-profit art center: Purple Word Center for Book & Paper Arts in Jackson, MS.
Sandra earned her BFA at Alfred University and her MFA from Louisiana State University. 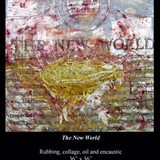 She has had solo exhibitions at such places as the University of the Arts and Mansfield University, both in Pennsylvania, the Greater Jackson Arts Council, Loyola University in New Orleans, Rockhurst University in Kansas City, Delta State University in Cleveland, MS and the Cottonlandia Museum in Greenwood, MS. Sandra has shown her work in 60 national and international juried exhibitions. 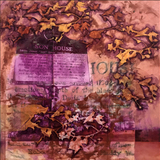 Her work is featured in the newly published book entitled Contemporary American Printmakers. She was nominated for a 2015 Joan Mitchell Foundation Grant for Painters & Sculptors. Sandra has been a visiting artist in numerous institutions including: Appalachian State University, Lawrence University, Southwest School of Art & Crafts, University of Tennessee in Knoxville, and the University of Wisconsin at Madison. She serves as the Vice President of Internal Affairs to SGC International. Sandra has taught print and book arts courses at Arrowmont School of Arts and Crafts in TN, Southwest School of Art & Crafts in TX and has served as a master printer at the Center for Contemporary Printmaking in CT. She is represented by Guy Lyman Fine Arts Gallery in New Orleans on Magazine Street.